In today’s competitive, highly regulated environment, product success is dependent upon data and fact-based decision making. More and more, Medical Affairs teams play a pivotal role in education pre- and post-launch, yet the explosion of big data in healthcare is changing how we make value-based decisions that are critical to success. 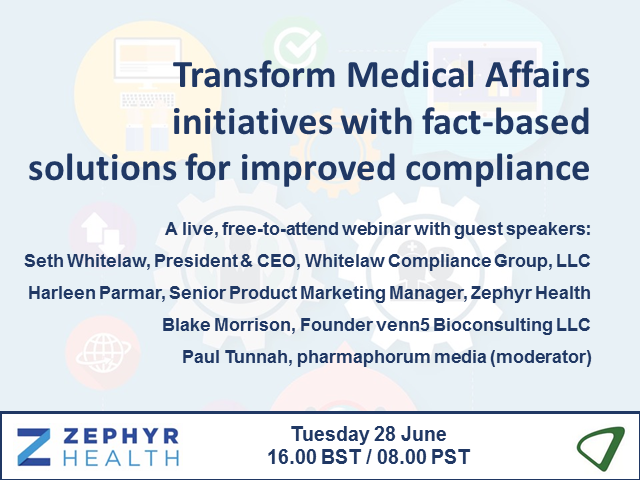 This webinar will explore the challenges Medical Affairs teams have finding a repeatable, objective and compliant solution to identify and manage their strategic programs. With a wealth of information available, it can be difficult to sort through data and understand what is important to incorporate into research and strategy. In this session you’ll hear needs and use cases for having a robust data strategy when it comes to Medical Affairs success. The panelists will share best practices for making fact-based decisions that meet compliance restrictions, using powerful market insights gained from multiple data sources, to optimize strategic planning and ultimately drive product success.